Street Kitchen is back! A collaborative effort between chefs Jun Tanaka from Pearl and Mark Jankel, the Street Kitchen airstream first popped up during London Restaurant Festival last year in Covent Garden to bring healthy bistro style dishes in take away boxes to Londoners. I love its ethos. Mark has a B.Sc. (hons) in Environmental Science from the University of East Anglia and is devoted to reliable quality sustainable food sourcing. Therefore, all the produce used by Street Kitchen comes directly from the suppliers to ensure quality and freshness. Throw in the gourmet skills of the two chefs and what you have is a fantastic meal cooked using excellent produce, and at very reasonable prices. 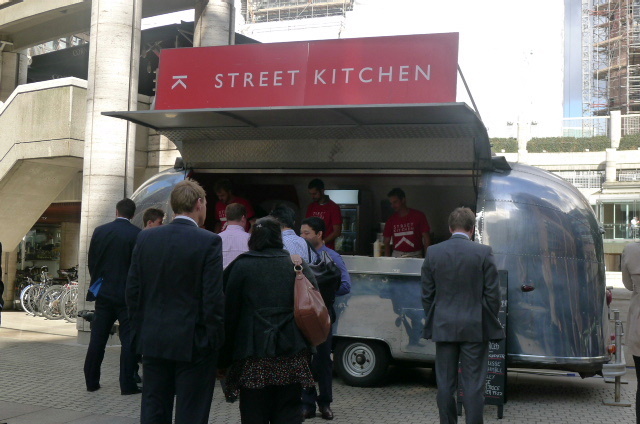 Street Kitchen has now found a permanent home at Broadgate Circle in Liverpool Street and serves lunch between Tuesdays and Fridays. It’s a great spot and sees a lot of thoroughfare from the city crowd. The menu is simple and changes regularly depending on what is in season. There is a choice of meat, fish or veg for mains, plus a dessert option. We managed to find a sunny spot nearby to have our lunch, but I imagine as the weather gets colder this won’t remain an option. 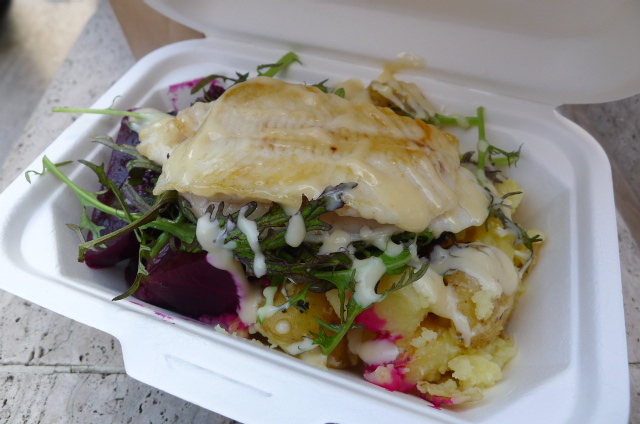 We tried Dover sole fillets with horseradish dressing, crushed potatoes and beetroot (£7.50). Dover sole doesn’t come cheap and I was extremely impressed that this was on the menu. The fish was lovely and the dressing worked well with it. The crushed potatoes were fantastic and the beetroot was earthy and sweet. 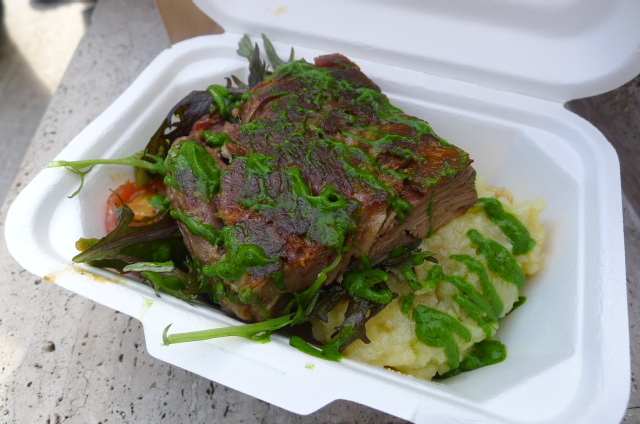 LD loved the slow roasted lamb with veg and basil dressing (£7.50) as did I. The lamb was very tender and pulled away easily. Also served with crushed potatoes, the veg mixture of courgettes, baby tomatoes and runner beans was full of flavour. 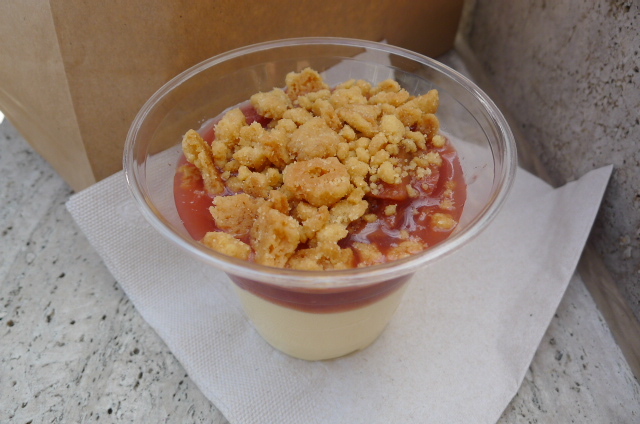 Dessert was yoghurt mousse with rhubarb and crumble (£4.50). The mousse was lovely and creamy and the acidity of the rhubarb cut through this richness nicely. The crumble added a lovely textural crunch. The portions were generous and the pricing is incredibly reasonable. But above all, the food is great. You can really taste the freshness and quality in the produce. As my friend LD said, she has paid far more for far less. Ooh…I wish it was still at Covent garden where it is so close to my workplace. Takeaway doesn’t come much better! Love this place. Very excited about this. Always thought London needed more places like this, NYC has a lot more of this sort of stuff. Here’s hoping more to come soon! its not so bad if you get to Holborn and hop on the central line. 🙂 I think it would be worth your while. yes I love this place too. Such good value for such good quality. Yes its exciting that there is something like this in London. I think its one of the best eating options in London! For £7.50, absolutely fantastic. The pork was falling apart, lovely bit of crackling on top. Seriously need more stuff like this around the city! Is it definitely a permanent venue now then? Yes I’ve been told its permanent.